Search.searchpat.com is nothing more than yet another browser hijacker that should not be tolerated under any circumstances. Due to its invasive overall functionality, it is not surprising that our research team urges you to remove it if it is ever found up and running on your personal computer. By making unwanted changes to your default web browser's settings the hijacker in question is capable of ruining your overall online experience. In the majority of cases this invasive piece of software is distributed in devious ways; thus, in our report we provide imperative virtual security tips that will allow you to maintain a fully secure system at all times. Also, we present our further findings about Search.searchpat.com, which should make you realize the importance of this hijacker's removal. Make sure to follow the instructions that we provide below to terminate Search.searchpat.com in its entirety. Search.searchpat.com works in a rather simple manner as its functionally resembles the inner workings of other devious programs that are classified as browser hijackers. Once it gains full access to your PC, it will trigger a change of your web browser's default homepage. This is a fundamental change, which will result in a ruined online experience because for as long as this unwanted piece of software is fully active on your PC you will not be able to start your online session on a homepage of your preference. Instead, you will be presented with a questionable third-party website. The site set as your new homepage presents a questionable search field, which we advise you not to use as it could prove to be quite dangerous. This is so because you could come along a suspicious result hosting redirect links. It is a dangerous instance since clicking on it could result in a redirection to some suspicious third-party website that might turn out to be a harmful one. Some of the sites encountered via redirection links could be designed by malware developers. It goes without saying that just entering a web page crafted by cyber crooks could have devastating outcomes since in some cases a single entrance is enough to get your PC infected with some other unknown malware. It should be quite obvious that Search.searchpat.com is not only an annoying but also a dangerous program. It must be dealt with as soon as it is found running on your PC. Make sure to use the removal guide that we present below to get rid of this browser hijacker once and for all. To avoid getting your PC infected with Search.searchpat.com or any other malicious program, make sure to take preventative steps to improve your virtual security. Firstly, make sure to practice safe browsing habits since the hijacker in question is known to be spread in suspicious ways. The most common means of distributing invasive software is via bundled installers. To avoid getting your personal computer infected in such a manner, be sure to avoid all unauthorized third-party download websites. This is critical since such web pages are known to be the main source of software bundles. It is also important to take your time to pay as much attention to every single step of an installation procedure as you could come across an opportunity to cancel the installation of some undesirable program by unmarking a single box. Also, remember that quite a few developers of suspicious applications use devious marketing techniques to fool unsuspecting users into downloading their software without understanding how it functions. Therefore, it is paramount to learn about the program that you wish to run on your PC as much as possible before even downloading. Last, but not least, make sure to install a professional antimalware tool if you do not have one already. Such a tool is crucial as it provides virtual security at all times. These precautionary steps will allow you to keep your operating system clean and secure at all times. 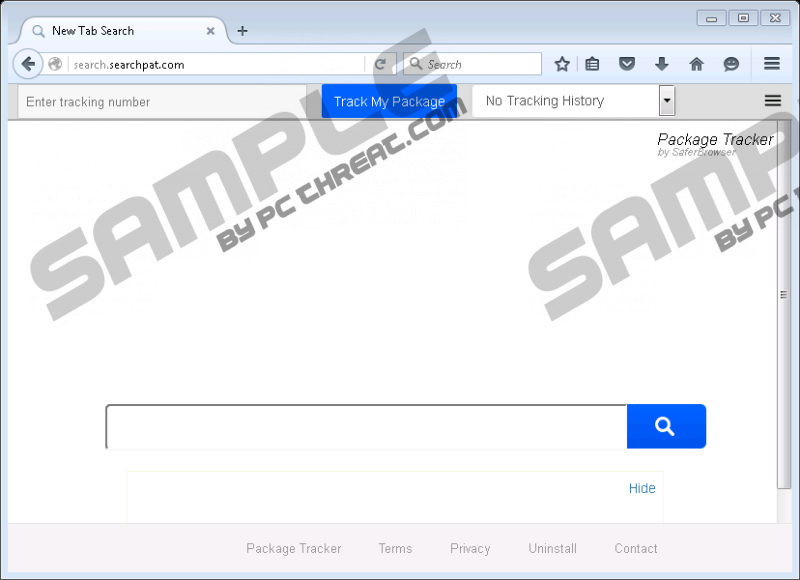 Take immediate action if you ever find Search.searchpat.com active on your personal computer. The manual removal must be executed with care since a single missed step or a mistake could lead to an incomplete removal of Search.searchpat.com. This means that certain leftover files or registry entries of the hijacker in question could still be fully active on your personal computer and could even be used for a silent restoration procedure. To be sure that you have successfully terminated the invasive program you need to either execute a detailed analysis of your PC for traces associated with it or to perform a full system scan with a reliable antimalware tool as it can automatically identify and delete anything linked to it. Locate and delete files that called Secure Preferences, Preferences, and Web Data. Type regedit into a search box and then select it. Right-click a registry value called Start Page and then select Modify. Quick & tested solution for Search.searchpat.com removal.